Blog Quick Quotes: Cards inspired by the holidays! Cards inspired by the holidays! We hope you enjoyed the last 5 days of our blog hop with Petaloo. To tide you over before the winners are announced, here are some 'amazing' cards inspired by the upcoming holidays. Hi there! 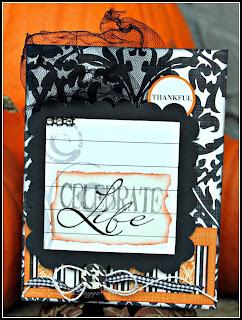 Rhonda here to bring you a fun little card that I created using the Club Q October kits. I wanted to create a Thanksgiving/Fall themed card with the very elegant papers from the kit. To play a bit with the elegance of the papers, I include a bit of black tulle. I attached it with some staples, then melted the top ruffles just a bit with my heat embosser. One of the small black laser cut frames was the perfect size to create my sentiment block. Once I adhered the paper from behind and it dried, I attached it to the base using foam dots. Aren’t the patterns and swirls in this line just beautiful? I tore my itty bitty quote vellum, then inked the edges with Mango Mai Tai. I decided to step outside the box and create some Holiday goodies! JOY card - A mix of Savvy Davvy, Damsel in Distress, and Cherry Truffle come together for a card of more traditional colors. I cut one shadow and two snowflakes using my Cricut Expression and Winter Lace cartridge. I layered the snowflakes using foam tape adding more dimension to the card. To create the sentiment, I wrote the word out using a pencil then stitched over my pencil markings. Celebrate the Sesaon Card - A mix of papers from Savvy Davvy and Miss Morgan blend well together to create a holiday card of non-traditional colors. The tree was cut using Cricut Expression, gypsy, and Christmas cartridge. Be sure to check back tomorrow when all 5 winners from the blog hop will be announced! beautiful card Rhonda!!!! Looove the netting on there!!!! Absolutely gorgeous cards Jodi!!! Thanks for sharing your talent with us this month! Beautiful projects, every one of them! All of these projects are gorgeous! Love the card, Rhonda, and Jodi, you have done an outstanding job as GDT this month! I was a little surprised when I popped over here from the Petaloo blog as I expected to see more designs using their beautiful flowers with the scrumptious QQ papers and quotes. It was a fabulous week with the two companies working together and I hate to see it end. I was amazed at how well the products work together yet each stands very well on it's own too. Can't wait to find out who the winners are tomorrow! Great Christmas projects. My creative juices are just flowing. Jodi, your projects and presence here at the QQ Blog have been amazing. Thank you so much for sharing your talents with us. I am truly inspired by your beautiful work! It was a pleasure seeing all of your projects through out the month here at Quick Quotes. Thank you again!